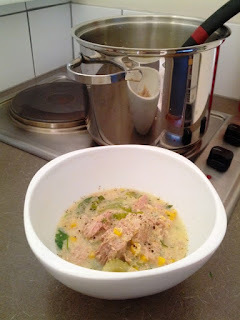 Healthy and quick to make. What more could you ask for after a hard day at work...perhaps a cold beer to match? Heat the oil in large saucepan over a medium-low heat & add the onion & celery. Cook until both are soft, about 5-10 minutes. Stir in the flour & cook for another minute. Turn temperature down low and slowly add in the milk, mixing it in. 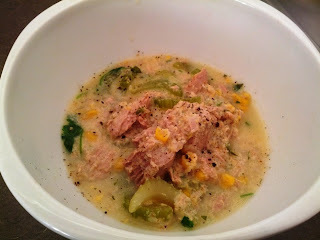 Add the tuna & its liquid, sweetcorn & thyme. Mix then bring to the boil. Cover & simmer for 5 minutes. Remove pan from heat & season to taste. Sprinkle chowder with a pinch or two of cayenne pepper depending on how hot you like it & chopped parsley.